We explore the consequences of a 2004 tax change in China that reduced the value-added tax (VAT) on equipment investment. While the goal was to encourage technology upgrades, we find little evidence that the reform achieved its intended results. Although firms shifted the composition of investment toward machinery, actual investment rates were unaffected. Firms replaced labor with machinery, leading employment to fall significantly in the treated provinces and sectors. Our results suggest that the primary impact of the policy was to induce labor-saving investment. Much of the literature in public finance explores how tax reforms affect firm behavior (Hassett and Hubbard (2012), Griffith, Miller, and O’Connell (2014)). Policy makers use tax incentives to encourage firm investment, and China provides a fertile ground for observing some of these policy experiments. Beginning in 2004, the Chinese government implemented VAT reform in three northeastern provinces, which eliminated double taxation on investments in machinery. In 2009, this tax reform was extended to the whole country. The objective of the 2004 reform was to encourage firms to raise investment spending on fixed assets for production (excluding structures) and to upgrade their machinery and equipment. The goals of the 2009 reform were similar, but in addition, the government sought to help firms weather the adverse effects of the 2008–2009 financial crisis. The tax reform was also part of an industrial policy that focused on promoting more technologically advanced sectors. In China, the VAT is the major source of fiscal revenue for the government, generating much more revenue than any other types of tax. In 2002, revenue from the VAT was 814.4 billion RMB, accounting for around 48% of the total state tax revenue. In 2009, the Chinese Ministry of Finance estimated that VAT revenue accounted for approximately 31% of China’s overall revenue. Prior to 2004, China had a production-based VAT, and purchases of fixed investment could not be deducted from sales when calculating VAT liabilities. Consequently, investment goods were taxed twice: first when firms purchased the goods and again when consumers purchased the final product that had been produced using the investment goods as intermediate inputs. Concerns were raised that such double taxation could increase the cost of investment, leading firms to operate with old equipment and out-of-date technology and consequently leading to less productivity growth. The 2004 VAT reform eliminated double taxation and alleviated firms’ tax burden. Because the reform reduced the cost of physical investment, treated firms were expected to increase investment by upgrading machinery and to improve productivity. Because of the substitution between labor and capital, the reform—which lowered the cost of physical investment—was also expected to reduce demand for labor. The 2004 VAT reform was implemented only in three northeastern provinces (Liaoning, Jilin, and Heilongjiang) and six industries (See Note 1). Comparing development indicators between the treated and control provinces before 2004, we find that there were no significant differences in GDP, government revenue, VAT revenue, investment, number of firms, or fixed assets between treated and control regions prior to the reform. Despite anecdotal evidence suggesting that the treated regions are typically considered backward, our evidence indicates that the firms we examined in the treated and control regions were reasonably similar. The policy change is evident from the trends in Figure 1, which shows the growth of value added taxes in treated and control groups from 1998 to 2007. The VAT is defined as the VAT paid divided by value-added at the firm level (See Note 2). Figure 1 shows that over the sample period, the value-added tax rate paid by firms in control sectors in control provinces did not change much and growth rates were essentially zero before and after the 2004 reform. However, one year after the VAT reform was implemented in 2004, there was a significant decrease of 2 percentage points in the growth of the VAT paid by treated firms, and the tax paid by treated firms continued to fall until 2007. Looking at firms in the control sectors of treated regions, there was a jump in the VAT paid by those firms in 2005, but it fell afterwards. 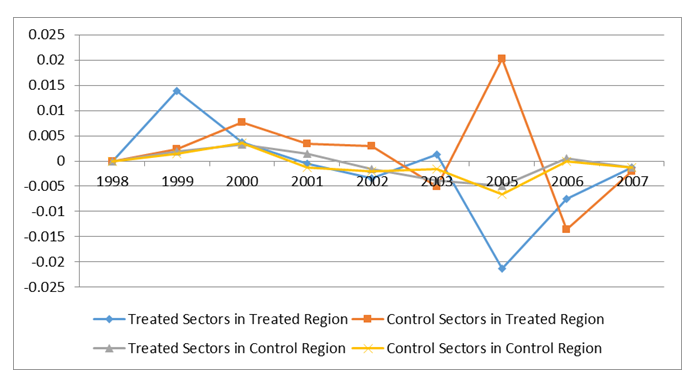 The evidence in Figure 1 shows essentially no change in value-added taxes for both the treatment and control sectors in the control provinces but significant reductions in the VAT rate for treatment sectors in treated provinces between 2003 and 2005. We study the effect of this change. In this study (Cai and Harrison (2018)), we assess the effectiveness of the 2004 VAT reform in China. We use a firm-level panel data set covering 1998 through 2007 to identify the effect of the 2004 VAT reduction in selected provinces on the behavior of manufacturing firms. Our measures of firm outcomes are broad and include investment, the share of new products in sales, productivity, employment, and exports. This reform is easy to study because we know exactly which provinces and sectors were targeted first, and consequently, we have a clean treatment group as well as a control group. We adopt a three-pronged approach to identify the impact of the VAT reforms. We begin by regressing a variety of outcomes on a treatment dummy and add a large set of controls including province dummies, industry dummies, year effects, province-year dummies, and firm fixed effects. We then augment this Difference-in-Difference specification with an instrumental variable estimation using a theoretical VAT ratio—the VAT ratio that would apply if an eligible firm made a fixed investment—as the instrument for VAT payments. Last, we use a propensity score matching combined with difference-in-difference estimation to account for the potential selection bias of treated regions and sectors. All our statistical approaches suggest that the reform was effective in reducing the incidence of value-added taxes paid by firms, with value-added taxes falling 1 to 2 percentage points in the treatment areas relative to the non-treatment areas. The statutory rate for the VAT is 17%, so the reduction in VAT paid in treatment areas accounts for a 6% to 12% reduction in the statutory rate. We also explore the consequences for employment, investment, and other outcomes. The reform encouraged firms to substitute physical capital for labor: the policy significantly reduced firm total employment across all ownership types. The net impact of the reform was to increase the capital intensity of production, defined as the labor to capital ratio. As the reform focused on machinery and excluded physical structures from the VAT exemption, not surprisingly, we find that the composition of investment shifted towards machinery. However, the aggregate amount of investment did not increase. We also explore the impact on new product introductions, exports, and productivity growth. Productivity is measured by firm level total factor productivity, which we estimate using two methods: OLS with firm fixed effects and the Olley-Pakes method (OP). We find a reduction in new product introductions after the reform. The reform also negatively and significantly affected firm productivity and significantly decreased export intensity for most types of firms. The negative effects of the reform on productivity growth, new product introductions, and exporting is consistent with our theoretical model showing that the reform led firms to favor physical investments over human capital or intellectual capital investments. In addition, the reform encouraged firms to choose capital-intensive technologies, which may not have been consistent with China’s comparative advantage, at least during our sample period. Our evidence suggests that the primary effects of the tax reform over the three-year period following the policy changes were to reduce VAT payments, increase machinery investment relative to other types of investment, and cut employment. Firms shifted to more capital-intensive or labor-saving technologies. We propose two mechanisms to explain some of the unintended consequences. First, the VAT reform had heterogeneous effects depending on the extent to which firms were constrained prior to the reform. For firms with hypothetically big savings from the reduced VAT, we see large increases in the share of investment in machinery. We also show that the negative impacts of the VAT reform are concentrated in firms that already had access to cheap capital. The expected effects of lower VAT payments in stimulating investment were concentrated in firms facing higher interest rates, suggesting that the reform only promoted investment for capital-constrained enterprises. Second, the VAT reform led to significant declines in revenues for implementing regions. We show that this is the case by measuring the impact of the VAT reform on other industrial policies used by policy makers in these regions. The VAT reform is associated with a significantly lower incidence of subsidies, tax holidays, and low interest loans. We also find a significant decline in firm profits for domestically owned private enterprises. The fact that treated firms received less support from other government programs after treatment contributed to the observed fall in exports and new product sales. Our main focus is on the net impact of the reform, taking into account its opposite consequences for investment and for other industrial policies which were financed by VAT revenues. Why was the reform extended to the rest of China given that the benefits of the reform in terms of increasing aggregate investment and even productive investment seem quite limited and targeted at SOEs? One likely explanation is that extending this reform was part of a comprehensive stimulus package in response to the 2008–2009 financial crisis. This paper contributes to the existing literature in several ways. First, our paper is among the first to take advantage of a natural experiment of changed VAT rates and to use multiple rigorous estimation strategies to identify the impact of that change. Second, this paper also contributes to the literature that evaluates policy interventions in China. During recent decades, the Chinese government has implemented a range of industrial policies. Recent papers have studied the impact of policies such as tax breaks, general subsidies, and R&D subsidies on firm performance (Aghion et al (2015), Boeing (2016)). The 2004 VAT reform was a major policy change, but there is limited evidence on its impact. (One exception is Liu and Lu (2015) who analyze the consequences of the reform for exports.) We contribute to the literature by studying the impact of the tax reform on a comprehensive set of firm outcomes. Note 1: The six industries include agricultural product processing, equipment manufacturing, petrochemicals, metallurgy, ship building, and automobile manufacturing. Note 2: Please note that we do not include 2004 in the Figure because the variable value added is missing for that year in the NBS data.